Blog Is Toxic Masculinity a thing? 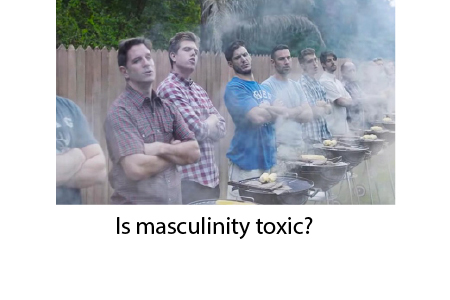 According to the APA, “traditional masculinity ideology” helps limit “males’ psychological development, constrain their behavior, result in gender role strain and gender role conflict, and negatively influence mental and physical health.” According to the APA, “traditionally masculine” men have built a system of masculinity around bullying rather than civilizing, around stolidity rather than emotional maturity. Thus, it is the fault of men that young boys are growing up to become toxic males. So the question is, why were people so angry at some constructive and positive aspirational notions with a strong basis in fact? This is not a rhetorical question. I will explain why people were mad. And it should be obvious to you unless you are totally gullible to the current vogue of leftist thought known as “intersectionality” that I describe here. If you replace the word masculinity and insert any other descriptor, like femininity, heterosexuality, blackness, whiteness, you realize that it is offensive. Not all men need to be reminded of the need to behave well any more than other groups need to be reminded to not behave in the worst ways that are associated with them. The current fad to target the perceived holders of power, the cis-gendered affluent, heterosexual, white male, has emboldened a conversation around the intersectionality of victimhood. To put it simply, the current culture war suggests that history is a dialectic between the relatively powerless, who are, by definition, inherently incapable of being racist, sexist, and bigoted, and the perpetrators of injustice. Ageist, sexist, and racist. Just apologize or say you were mostly kidding, Sarah. Instead, she doubled down and her supporters rallied. This is not the path to a better humanity. I can condemn Rep. Steve King’s bigotry and also condemn Sarah Jeong. We are all one human family. None of us are perfect. Let’s aspire to create a society that recognizes virtue and inclusion. The path to transcending bigotry is not with an endless redress of grievances. As always , right on! I am male, 68 chronologically, 31 biologically ( according to a telomere length test I had recently) single, never married, no children, not gay, not retired, self employed, work alone, do physical labor every day as part of my work(plumbing , carpentry, general maintenance etc). I live alone in a 4 bedroom log house which I heat with wood I get myself from the forest in which my subdivision is located using a wood central heating system I designed and built myself. my waist is 32, concave when viewed from the side and chest 45, sticks out. I am very muscular. I am very happy being alone and much inspired by the misandry expressed by Sarah Jeong, and probably, by millions of like minded women!